With Detroit’s weather projected to reach -40 with the windchill Thursday, it seems Autotrader’s list of “coolest” cars for winter couldn’t have come at a better time. The chilly weather doesn’t have to put a damper on driving. With the right vehicle, drivers can still enjoy hitting the road — even if it’s covered in snow, according to the upbeat executives at Autotrader. Autotrader editors have compiled their list of Top 10 Coolest Cars for Winter 2019, based on the most searched-for, winter-friendly vehicles that also provide standard or optional four-wheel drive or all-wheel drive. Topping the list is the Ford F-150. 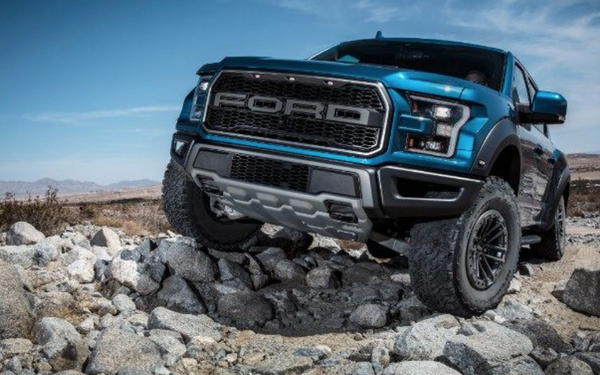 For winter, the best model is the F-150 Raptor, according to Autotrader. Other pickup trucks in the top 10 are the Chevrolet Silverado 1500 (in third place), the GMC Sierra 1500 AT4 (in fourth) the Ram 1500 (in sixth) and the midsize Ford Ranger (in ninth). For the best winter model, Autotrader recommends any Silverado equipped with the Z71 off-road package, which includes off-road suspension, hill descent control, skid plates, a locking rear differential and all-terrain tires. Autotrader’s favorite new Ram for getting through snowy winter is the Rebel, which has four-wheel drive, an off-road aesthetic, all-terrain tires, factory lift and locking rear differential. Other vehicles that made the list include the Jeep Wrangler in second place, Chevrolet Tahoe (in fifth), Toyota RAV4 (in seventh) and the Honda Passport (eighth). The only minivan on the list came in tenth, the Toyota Sienna AWD, the only minivan on the market available with all-wheel drive. “All-wheel drive is only available on the range-topping Sienna Limited trim, which is a little pricey by minivan standards,” per Autotrader.